Talk to William Flakes just one time, and you will instantly know he has a genuinely sweet spirit and a compassionate heart as he talks about his upbringing, about social work and about the at-risk youth in his old neighborhood where he longs to serve. William was a member of the very first cohort of Advanced Standing students at the Garland School of Social Work in Downtown Houston. 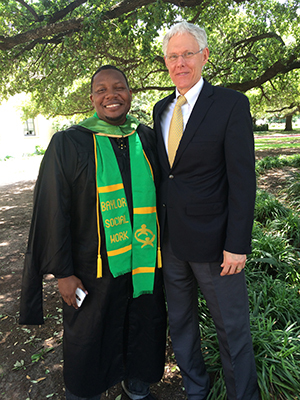 While opening that campus was history-making for Baylor University, it was life-changing for William. "I grew up in one of the roughest neighborhoods in Houston, in the Third Ward community," William said. "I never thought in my wildest dreams that I would end up at a place like Baylor University, but I applied because my professor [at the University of Houston-Downtown] was like, 'William, DO IT! DO IT!' I thought, the worst I can hear is no. So I did it, and here I am." When you look up the definition of the word dedication, you just might find William's name there as an example. Growing up in a drug-infested, crime-ridden neighborhood, education wasn't really encouraged nor was it considered much of an option in breaking the cycle of crime and poverty. "Kids in my neighborhood usually dreamed of athletics or rapping as their ticket out," William said, "but I longed for more." William explained how he owes much of his success and drive to one man, "a Caucasian" man that he became known to as "son" and still is today. You see, William lacked the support at home, much like most of the other youths in the Third Ward. William was one of three children to different men his mother never married, and William's father, who was never around, was shot and killed when he was just 10 years old. "I feel like I owe most of my success to one person." William said, "and his name is Steve Gartrell." At 13, William was part of an organization called School Yard Sports, playing basketball for them. One day, Steve, a counselor there, went around asking kids what they wanted to be when they grew up. One by one, their answers were nearly all the same: pro athletes, hip-hop rappers and R&B stars. Then Steve asked William that question, and his answer was: "I want to be a meteorologist." According to William, Steve's mind was blown, and that was the beginning of their extraordinary friendship. "[Steve] took on the role of being my dad. And to this day, he is 'Dad', and I am his son. He was never afraid to come into this violent environment and get me," William recalled, "to take me to basketball games, to show me what professional was. He just invested so much time, money, whatever you can think of in me. He was there. He was always there. He calls me God's Will." Steve became William's friend, mentor, and father and with that came an even stronger drive to do better, be better and serve better. William was able to escape the cycle of poverty and crime of his neighborhood, not only with Steve's help, but also with the influence of half siblings he found out about at his biological father's funeral. "With them, Will began attending church and learning of God's presence in even the worst of times and situations," Steve wrote in a letter entitled God's Will. "It has been Will's strong faith and his desire to show that faith through his life and works that has enabled him to rise above his circumstances." William graduated from Stephen F. Austin High School in 2000 and began college classes at the University of Houston-Downtown, majoring in Criminal Justice, but stopped and started numerous times. It was during this time, while trying to figure out what he wanted to do with his life, he began working for the Texas Department of Criminal Justice (TDCJ) as a guard in the residential treatment centers. This is where he found his calling in the field of social work. "I just kept thinking, 'What do I really want to do? What am I really good at? What is my calling? '," William said. "Through church and the criminal justice system, I found my calling. I noticed there was really nothing between the residential treatment centers and the penitentiary. So, I decided to finally finish my degree in social work so I can help sever that pipeline and become that in-between space." William eventually quit TDCJ but started his own trucking company to help pay for his courses. He finally finished up his degree at UHD in 2015, and went directly into the new MSW program at the GSSW in Houston. 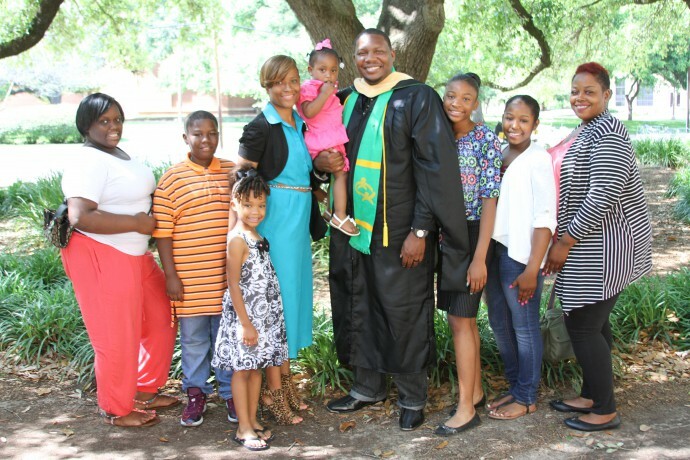 Even though he had his degree in social work, he admitted he was a bit overwhelmed with graduate studies, with working, with being a family man. But he was so determined to earn his MSW he even attended classes from the cab of his semi using Wi-Fi! "When I got there [GSSW-Houston], it’s funny because when I would feel so behind I would think to myself 'Everyone knows more than me!'" William said. "I didn’t even know what theories were. Or what therapies were. I just really knew one thing, and that was to be solution-focused. My Dad said, 'Will, they may have more book knowledge, but you've lived social work! You've got this!'" And he did! Will graduated in May with a 3.9 GPA, and has ONE goal in mind—to start a non-profit to meet head-on the challenge he saw while working for TDCJ, to sever the pipeline from poverty-stricken neighborhoods to the prison system. "I have already started it [his nonprofit], and it’s called The CORE. It centers around revitalization and empowerment and will focus on helping at-risk youth," William said. He has already formed a board and is currently looking for funding and a location in the Houston area. His programs will be after-school and athletic-based and will include job training skills and education. "I basically want to give kids healthy opportunities that will help them transition into the real world, and minimize opportunities for crime and prison," William said. "I literally come from nothing, but I am living proof that all things are possible, and I just want to be what God needs me to be for someone else."